This moving drama takes to the stage next week from Wednesday 25th to Saturday 28th April at The Arc Theatre. Move in is on Sunday 22nd April from 9am at The Arc. Saturday 24th March 2018: With a fantastic effort from 15 or so members, ex-members and associates we completed our transfer from the Glove Factory in Holt to our new temporary home at a unit in Steeple Ashton. Having filled up two skips worth we transfered the remaining chairs, tables, flats and a piano to our new store. We will look to have a working party at some time in the near future to have a tidy up there as there is still quite a mess to clear in some of the other rooms before we can make the most of the space. We are required to leave our current scenery store at Holt by the end of March. We are hoping to move our scenery into something like a shipping container which we can keep on the same site, at least temporarily. We have already been working at sorting out the scenery store, but we need another push at this. So, please come and help at 10am on Saturday 17th March 2018 at the store. We have quite a lot of furniture and props which you may be able to help us dispose of, or keep in a garage, perhaps. If you are on our mailing list, you will have already seen that we are holding a special meeting of the society to consider what we can do about our scenery store. We have been given very short notice to quit our current premises in Holt by the end of March 2018. We knew that there was going to be redevelopment of the site in the future, but we had been led to believe that we were safe here for at least the next year (and we have recently paid another six months rent). If you can come to the meeting, please do. (It’s at Trowbridge Town Hall on Thursday 8th February at 7.30pm.) If you can’t come and have ideas of places or people to contact (or radical ideas about what to do with the scenery! ), please get in touch with us to let us know your thinking. 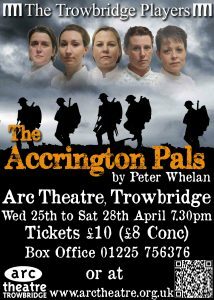 “The Accrington Pals” has been cast! We are pleased to announce that our play for the end of April, “The Accrington Pals” has been cast, and rehearsals are just starting. This is a moving and human play about important social consequences of the First World War, which ended 100 years ago this coming November. Please put the dates (Wednesday 25th to Saturday 28th April 2018) in your diary and come and see the show! We have decided to produce “The Accrington Pals” as our Spring production, running from 25th to 28th April 2018. The play is about the experiences of a group of young people in Lancashire when the men answer the call to volunteer and join up to fight in the First World War (which ended 100 years ago next year). MAY, (a stallholder) late twenties to mid thirties. The ‘Accrington Pals’ battalion actually existed and is well known, so it is essential that cast members attempt a north country accent (excepting C.S.M Rivers who can have any home-grown accent). Please do come along if you are interested in getting involved, and pass this information on to anybody you know who might be interested and not have seen it. Time rushes swiftly on, and we are getting geared up for the pantomime in January 2018! We’re doing “Snow White and the Seven Dwarves” in a version specially written for us. The performance dates will be Thursday 11th January to Sunday 14th January 2018, and Thursday 18th January to Sunday 21st January 2018. Performances on Thursdays are at 6.30pm, on Fridays and Saturdays at 7.30pm. 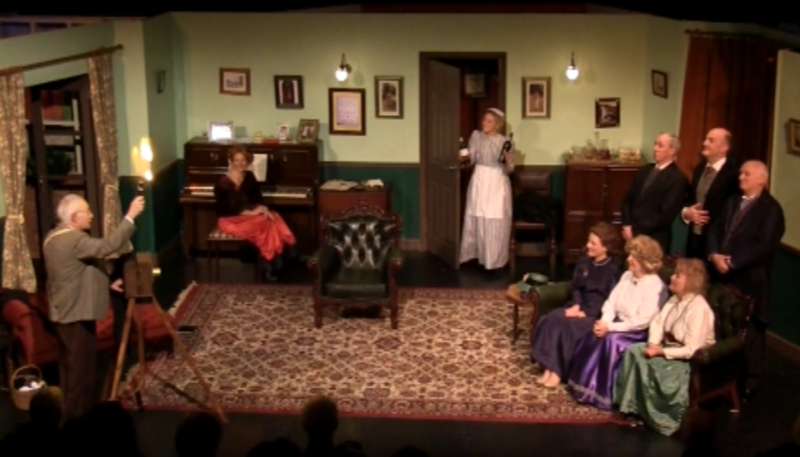 In addition, there are matinee performances on Saturday and Sunday at 2.30pm. The immediate thing is to have a reading. We read through Act 1 last night, and we are reading through Act 2 on Monday 18th September at 19:15 (7.15 pm) at The Arc. Following that, we are holding auditions (again at The Arc) on Sunday 24th September, at 14:00 (2 pm) for children auditioning as dwarves, and 15:30 (3.30 pm) for adults. There’s a lot of fun to be had at a pantomime, and possibly even more performing one. Do come along and join in if you can. The Trowbridge Players Annual General Meeting is coming up on Monday 4th September at 19:30 at the Tesco Community Space. This is the annual opportunity for members to steer the society, to decide on things like who runs it and the costs of membership, ticket price policy, etc. We also award the Eileen Atkinson Rose bowl annually to the person we vote has done the most for the society in the past year. (We like to have nominations for this in advance, so if you are thinking of somebody who needs to be rewarded in this way, please let us know as soon as possible). This year we thought we’d like to make it a bit more of a social, so we will also be having some pizza (!) and something to drink. Please do come. You can’t vote if not a member, but you’re welcome to join! The more who come and let us all know what you think, the better able we are to match your expectations and desires. As you would expect, we are well under way with rehearsals for our Autumn production which is a thriller by Francis Durbridge called “Suddenly at home”. We have already received offers for help with this (things like props and front of house) but any more offers are also very welcome. The dates of the production can be seen in the diary of events.